In June 2003, atmospheric scientists at NASA’s Goddard Space Flight Center and the University of Maryland, Baltimore County, used satellites to track how much sulfur dioxide streamed into the atmosphere from a fire at a sulfur mine and processing facility near Mosul, Iraq. They calculated that the fire at Al-Mishraq, which burned for nearly a month, released 21 kilotons of toxic sulfur dioxide per day. That is roughly four times as much as is emitted each day by the world’s largest single-source emitter of sulfur dioxide, a smelter in Noril’sk, Russia. Thirteen years later, history seems to be repeating itself. 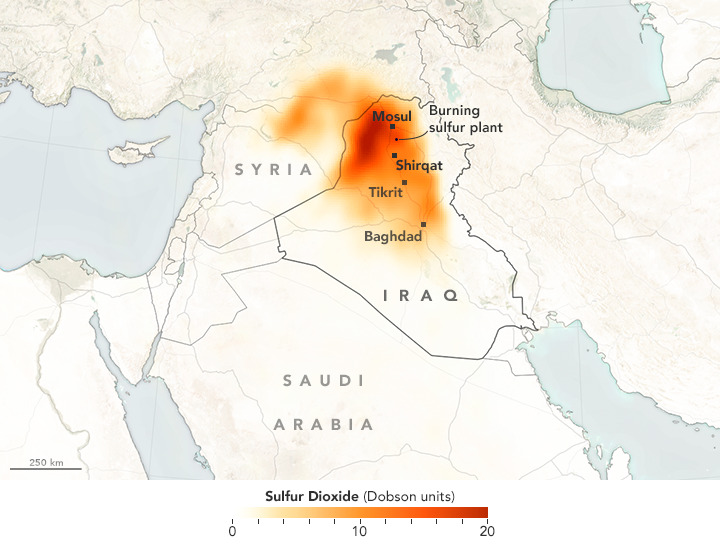 A fire at the same sulfur facility in Iraq is emitting tremendous quantities of sulfur dioxide into the atmosphere. Once again, this group of scientists is closely watching the events in real time—only this time they have a more capable set of satellite instruments at their disposal. The Moderate Resolution Imaging Spectroradiometer (MODIS) on NASA’s Terra and Aqua satellites first detected the heat signature of the fire at Al-Mishraq on October 20, 2016. By the next day, a plume of white smoke was streaming from the facility. 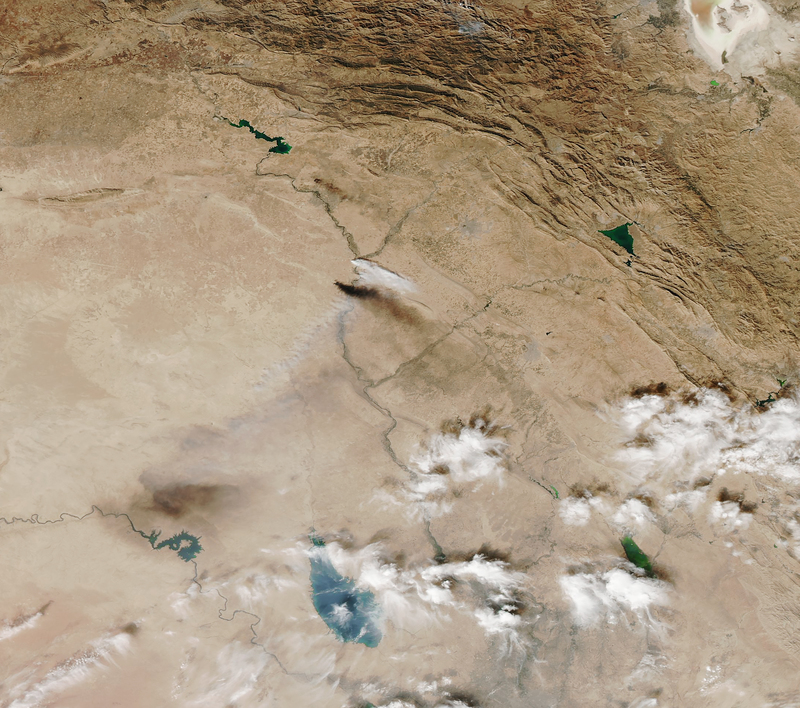 Meanwhile, the Ozone Monitoring Instrument on Aura and the Ozone Mapping Profiler Suite (OMPS) on Suomi NPP began making observations of a large sulfur dioxide plume spreading across northern and central Iraq. Initially, OMI detected sulfur dioxide in the planetary boundary layer and lower troposphere, the lowest parts of the atmosphere. Over the next few days, the plume responded to shifting winds and reached higher into the atmosphere. “In the first few days, the fire did not appear to be particularly energetic and our preliminary observations suggest that much of the sulfur dioxide remained in the boundary layer and the lower troposphere, which accentuates the impact on air quality and health,” said Simon Carn, an atmospheric scientist at Michigan Tech. ”More recently, sulfur dioxide has been lofted to higher altitudes where it may undergo long-range transport.” In high concentrations, sulfur dioxide can impair breathing and even be life threatening. According to news reports, two people have died after breathing sulfur fumes, and up to 1,000 people have been treated for breathing problems. 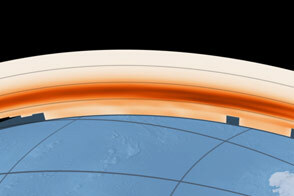 The map above shows the extent of the plume within the planetary boundary layer as observed by OMI on October 24, 2016. The natural-color image was captured by MODIS on October 22, 2016. The plume from the Al-Mishraq sulfur plant appears white-gray because it is rich with sulfate aerosols and droplets of sulfuric acid, which reflect light. 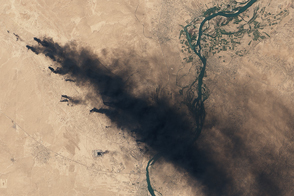 Smoke plumes from the Qayyarah oil field are black because they are rich with black carbon and other aerosols that absorb light. Already, sulfur dioxide emissions from the fire have been significant. If the sulfur dioxide were coming from a volcano rather than a fire, it would already be among the largest eruptions of 2016, Carn noted in a tweet on October 25, 2016. Editor's Note: The sulfur dioxide map was updated after publication due to underestimated values. More sulfur dioxide was observed in the atmosphere than we initially reported. NASA Earth Observatory images by Joshua Stevens, using data provided courtesy of the Aura OMI science team and MODIS data from LANCE/EOSDIS Rapid Response. Caption by Adam Voiland. A fire at a sulfur mine and processing facility near Mosul has raised a noxious cloud of sulfur dioxide over much of northern Iraq. 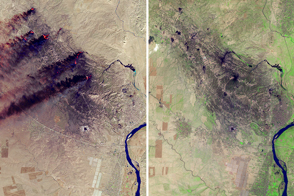 Oil fires burned in northern Iraq for several months in 2016 and 2017. Al Jazeera (2016, October 22) Sulphur cloud from torched plant kills two Iraqis. Accessed October 25, 2016. Barker, J.M. et al. (2006) Economic geology of the Mishraq native sulfur deposit, northern Iraq. Society of Economic Geologists. Carn, S.A. et al. 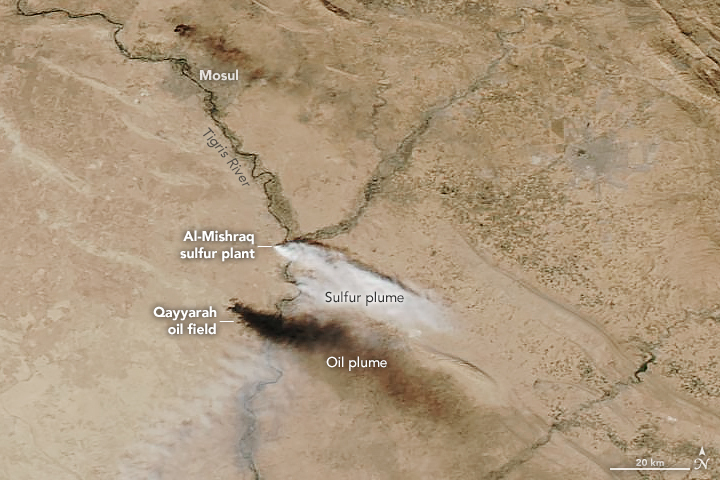 (2004, October 8) Fire at Iraqi sulfur plant emits SO2 clouds detected by Earth Probe TOMS. Geophysical Research Letters. 31 (19). Fioletov, V. et al. (2016, September 15) A global catalogue of large SO2 sources and emissions derived from the Ozone Monitoring Instrument. Atmospheric Chemistry and Physics. (16), 11497-11519. 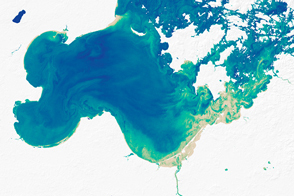 NASA Earth Observatory (2016, September 2) Oil Fires in Iraq. NASA Jet Propulsion Laboratory (2003, July 14) Iraq Sulfur Fire. Accessed October 26, 2016. Rudaw (2016, October 22) Hundreds suffer after ISIS sets fire to sulfur plant near Mosul. Accessed October 25, 2016. The Wall Street Journal (2016, October 23) Islamic State Burns Sulfur Stocks Near Mosul, Creating Hazard for Troops, Locals. Accessed October 25, 2016. Time (2016, October 23) ISIS Sets Oil and Sulfur Fires in the Battle for Mosul Accessed October 25, 2016. U.S. Department of Veterans Affairs Sulfur Fire at Mishraq State Sulfur Mine. Accessed October 25, 2016.